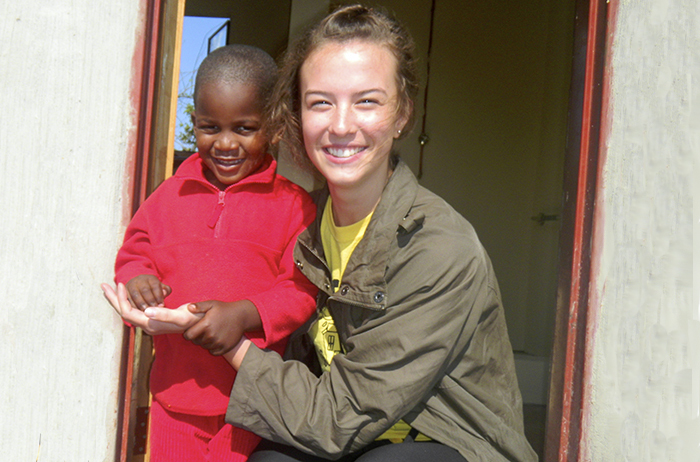 Julia Schneider ’15 traveled to St. Lucia, South Africa, to perform volunteer work. There’s a strong streak of idealism in biology major Juliana Schneider '15, and an entrepreneurial spirit that transforms her good intentions into good deeds. At age 16, she responded to the historic earthquake in Haiti by raising funds to help rebuild affected schools; today, she's the founder and president of a nonprofit organization supporting schools in America and beyond. Schneider also performs leukemia research at Dickinson, a project with personal ties. Her international adventures include a volunteer trip to South Africa, which inspired her to focus her current fundraising efforts on that region, and a research project with fieldwork in America and Japan. Here, she relates her experiences as a second-generation Dickinsonian, biology major, volunteer and entrepreneur. Jules for Schools: Building Schools for Kids in Need (founder/president), Pre-Health Society, Pi Beta Phi (executive board member) and Red Devils Cheerleading Club (former captain). My mom graduated from Dickinson in 1983 (chemistry major), and I grew up hearing all about what a rewarding experience it was for her. I didn’t think anything could possibly be that great—until I visited Dickinson and fell in love with the school. My decision is justified by the relationships I have with my professors, the close friends I’ve made and the opportunities I’ve been given. Starting my own nonprofit organization at age 16 and watching it develop and change. I held events such as yard sales and 5K walks [to benefit] a homeless shelter in Hawaii; a seminary in Pennsylvania; the Cross-International Corporation; and schools in Haiti, South Africa, Appalachia and Missouri. My donation to a South African daycare center funded a phase of renovations. My goal is to raise enough money to build a school in an area of need. My experience working as a researcher in Associate Professor [of Biology] Mike Roberts’ lab. I have always been fascinated by cancer mechanisms and treatments. Through this research I am able to work with acute myeloid leukemia cells. My grandmother passed away from chronic myeloid leukemia five years ago, so this opportunity has been particularly meaningful, and I have learned so much from working with Professor Roberts. This experience has fueled my motivation to become an oncologist. Cooking. In my spare time on breaks, I love tweaking different recipes and making new meals and baked goods for my family. I am currently in the process of compiling a family cookbook. … we would all have the mind of Steve Jobs, the spirit of Randy Pausch and the heart of a Zulu child. Last summer I participated in Dickinson’s U.S.-Japan Global Scholars Program. We spent a month conducting research with older adults in Carlisle and a month doing the same in Japan. While in Japan, the most memorable experience was our homestay. It was wonderful experiencing Japanese culture firsthand—we ate locally harvested foods and slept on tatami mats. I traveled to St. Lucia, South Africa, as part of a mission trip. I was shown a world that I had only seen in pictures. It put names to the faces of people in need [and] proved the fact that material goods do not equal happiness.